First things first... Happy New Year! I had a great couple of weeks in hibernation. Santa was wonderful (as usual) and I am now the happy owner of a lightpad! 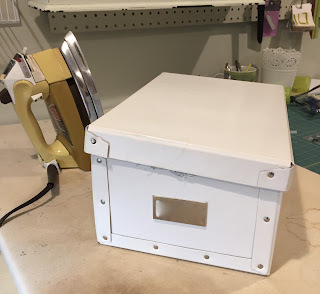 This is the newest version of a light box. I began coveting one after my first fusible applique class - and could see the advantages of not having to tape everything up on the window for doing transfers. But I'll talk about that later (in a future post). Now for the matter at hand. (See pic above). 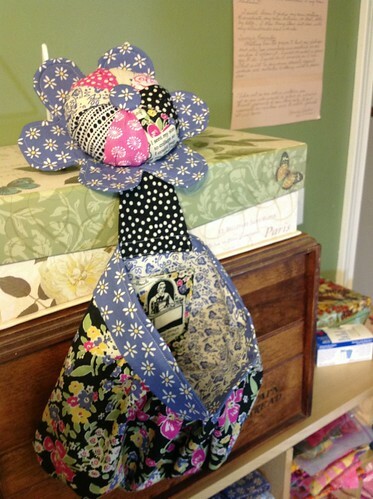 I've had the Abbey Bag pincushion & scrapcatcher pattern for a couple of years now. I was feeling a little overwhelmed by the number of incomplete stalled in process projects I have going at the moment, so I needed something quick and easy that "smelled of success". I also needed a pin cushion. I had seen this particular pattern done up in the "Housework Whenever" fabric line - and being as that pretty much is my credo for life (think grave marker material) I finally found it online in an Etsy store. (I had to purchase a whole quilt kits worth however - so I anticipate I may actually go to my grave swaddled in the stuff). I have to say I really enjoyed making this pin cushion. It has a little inside pocket to hold anything from your TV remote (I confess I do watch telly while sewing something repetitious) or my glasses. I'd never heard of using crushed walnuts for stuffing but was willing to give it a go - and I am converted! I liked it much better than rice. I found it at Petsmart and I probabely have enough to make pincushions for everything person in my neighbourhood. I initially overstuffed the cushion the first time round and had to dump it out and start over. The pattern also called for "fabric glue" - again something that I've never used before. But I ventured on. 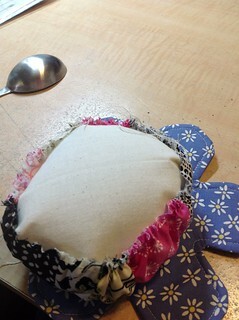 I decided to alter the pattern using a velcro patch to attach the scrap catch to the pincushion because I haven't really found the best place yet to put them both together - *being left handed I like to keep my pins etc to my left*- so most of my notion etc are all there. Okay - back to the better at hand - here is my pretty pincushion all done! I will make a few more in the future to give as gifts...the Abbey Bag is delightful! So based on my personal taste of fabrics selected and my abilities I give this project a big 4/5 thimbles up!